Starting location: Top of Shenandoah Mountain on Rt. 250. From Staunton, VA, travel 24 miles west on Rt. 250 to the parking lot on your right. Vault toilets are available at the parking area. Notice the interpreted ½-mile trail for the Confederate Breastworks historic site. The Shenandoah Mountain Trail is yellow-blazed, starting at the stone steps near the bathrooms. Description: The Shenandoah Mountain Trail is one of the premier long-distance ridge-top trails in Virginia. Stretching along the high, long ridge of Shenandoah Mountain in the George Washington National Forest, the trail offers more than 50 miles of high-elevation backcountry paradise, passing through Ramsey's Draft Wilderness, several roadless areas, and the Shenandoah Mountain Crest - Cow Knob Salamander Conservation Area. 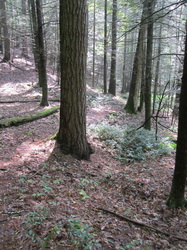 However, for this hike, we are describing only 3 miles of the trail, heading north from Rt. 250. 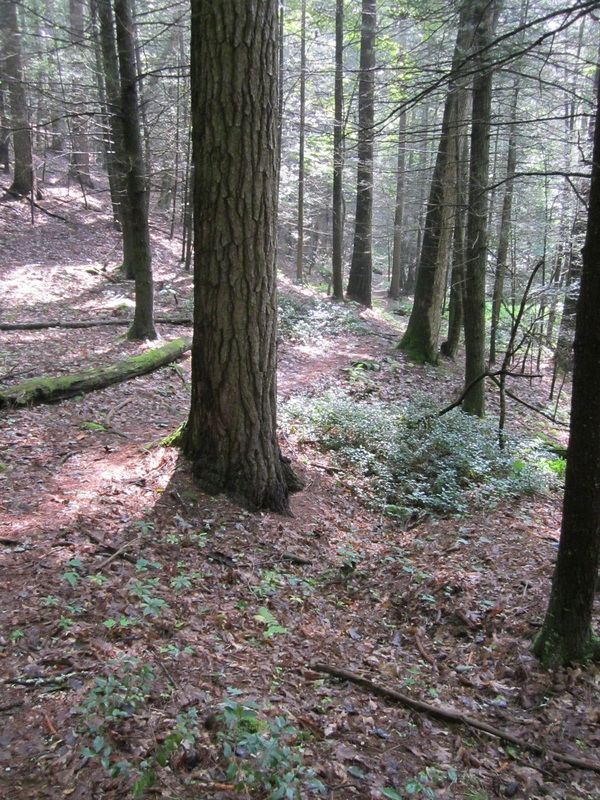 From the parking lot, walk north and gently uphill on the yellow-blazed trail. 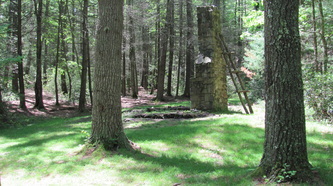 You will quickly enter mature forest and find yourself enjoying views to the east and west. After about two miles, Road Hollow Trail intersects. Stay to the left on Shenandoah Mountain Trail. After ½ mile, you will soon see a sign indicating you are entering Ramsey's Draft Wilderness Area, and a camping area to your right. A short distance later, take a right onto Jerry's Run Trail. 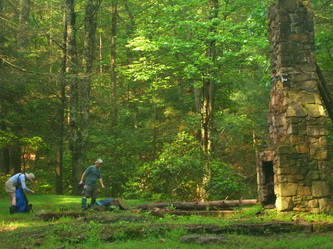 Descend toward the creek; after ½ mile you will cross Jerry's Run and enter the Sexton Cabin camping site. (Water is available from Jerry's Run, but should be treated before drinking.) This is the turn-around point. Follow same trail back to the parking lot. The first section of the trail is open to horses and bikes. 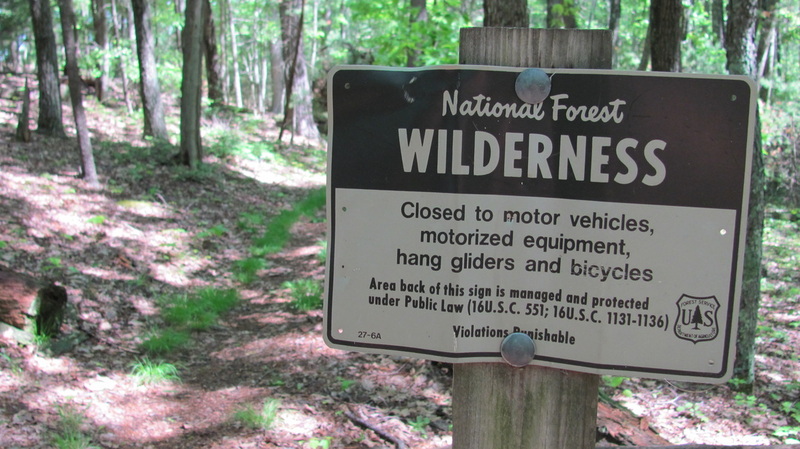 No mountain bikes are allowed into the Wilderness Area, and groups must be 10 or smaller. Why we like it: This section of the Shenandoah Mountain Trail is remarkably flat, level and easy to walk - a good choice for families with children or others looking for a very accessible backcountry experience. Walking along the top of Shenandoah Mountain, you will enjoy views to the east and west - nice in the summer, and incredible in winter. Because of the high elevation and remoteness of the trail, the forest is mature and offers outstanding birding opportunities, especially for neotropical migratory songbirds. 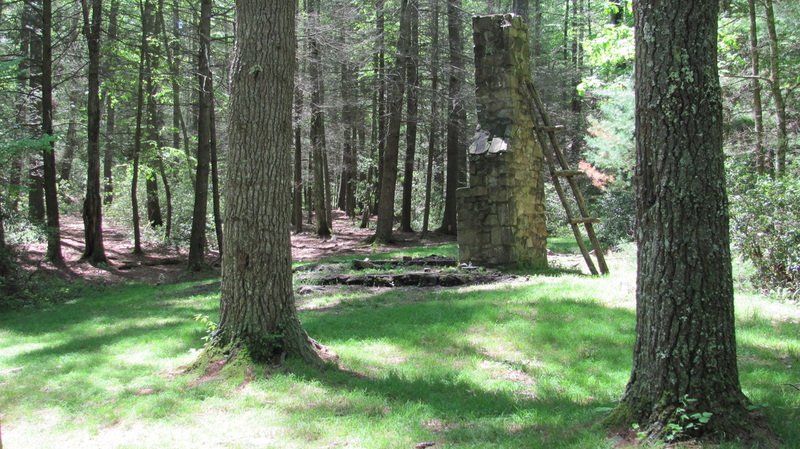 The turn-around point at the old Sexton Cabin site is a fantastic camping location, with a large, open grassy area and several campfire rings. You will enter Ramsey's Draft Wilderness Area about 2 miles in, and it definitely feels like wilderness. 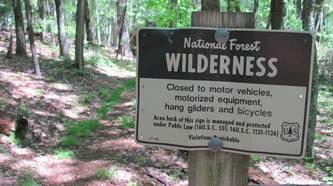 Remember that mountain bikes are not allowed in Wilderness Areas, but you are welcome to hike and camp. The open grassy area and stone fireplace at the end of the hike is the location of the former Sexton Shelter, built and maintained by the Potomac Appalachian Trail Club. Enjoy the special quietness of this place; take along a picnic and let the children play in the creek for a while, or carry a tent and enjoy a night under the stars - there are few camping spots this beautiful, wild, and remote, yet so accessible. The top of Shenandoah Mountain was once known as Fort Edward Johnson - if you have a little extra time, walk the ½-mile Confederate Breastworks trail loop from the parking lot. The interpreted trail describes the events of 1862 when Confederate soldiers defended the Shenandoah Valley from Yankee troops advancing from the West. You can still see parts of the defensive ditch built by the Confederate troops.